There isn’t anything more American than the Super Bowl. And, when I think about the hot competition on the Gridiron, my mind wanders a bit to other hot iron. Our Founding Fathers settled this land with their wagons loaded up with provisions and cast iron. Let’s honor them this Sunday by using some cast iron. I bet you have a Lodge skillet (12-Inch Skillet - Free Shipping) on the stove right now. Or, if you’re lucky, you may have an heirloom Wagner or Griswold, too. Here are my favorite 20 recipes to make in cast iron. This is from my all time favorite Chef - Alton Brown - a fellow Georgian, and more famous for being the host of Good Eats. This fried chicken is amazing but you have to plan ahead. The chicken needs a 12 - 24 hour dip in buttermilk. This recipe is from the restaurant magnate Bobby Flay - one of my favorite Chefs. The two main keys are: Using enough salt. The team from Bon Appetit thought the steak looked white after Bobby salted it! Getting the pan hot enough. Don’t be shy! The pan should be smoking when you let the oil heat up. But when I eat some delicious carbs, hash browns are one of my favorites! And, it’s a great way to nicely season your newer cast iron. Now, why is this called Southern? Northern cornbread tends to be a little sweeter with more flour which yields a more cake-like texture. You can “wow” a dinner table with a nicely roasted chicken. This version has some veggies that we don’t eat often in my house - rutabagas and turnips. They obviously turn out very good for this dish. I could eat pizza every single day. Cast iron skillet pizza never turned out right for me until I read this recipe from Nick at Macheesmo. The trick here is to heat the skillet on the stove for a few minutes to get the bottom hot. I like green chilies in just about anything. 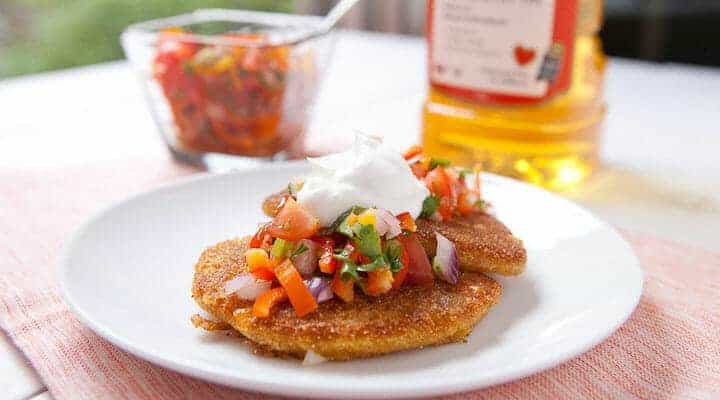 These corn cakes work out great along side some scrambled eggs. The recipe calls for Suriny Rice Bran Oil but you can use your oil of choice. I think coconut oil would be pretty interesting! Add some salty caramel and you have a great combination. The recipe says there are 16 servings but I’m pretty sure it’s just ONE serving for me. I didn’t know what a Dutch Baby was - Wikipedia to the rescue. Spoiler Alert. It’s a big pancake. 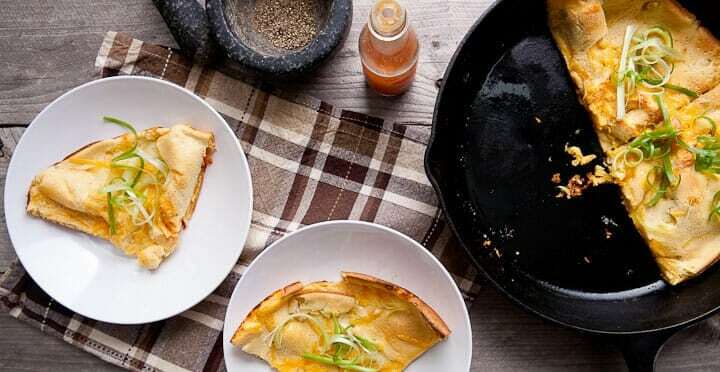 This savory version of a Dutch Baby hits the spot if you’re dealing with a hangover. Pro Tip: Add some cooked bacon to the mix. Trust me. I’m becoming a bigger fan of kale in my old age. And, why not combine this superfood with another “superfood” - Pizza! Be sure to cut out the center stalk from the kale so you don’t end up with an extra chewy piece. I suggest chicken sausage with apples to pair with the sauerkraut. And speaking of the sauerkraut...please skip the soggy, mass produced canned stuff. Look for fresh, refrigerated kraut in the fresh foods section of your market. This is a fast and simple meal. It’s really satisfying and filling, too. If you want to amp it up a bit, add some hot Italian sausage. Another one of my favorite things to eat - lasagna. Why not add more of the good stuff?! Mac & Cheese by Cook Like A Champion. 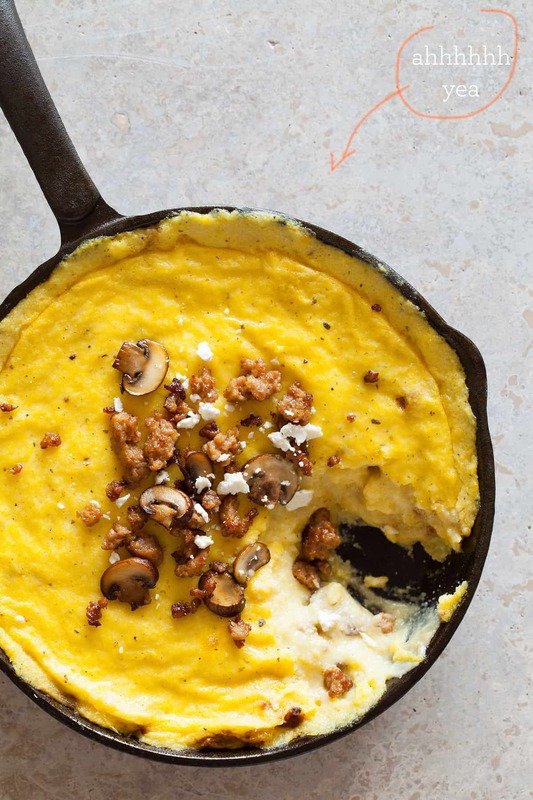 There is something great about the texture of baked polenta and goat cheese. It’s a fantastic combination when you add some Italian Sausage into the mix. This one is from royalty, Martha Stewart. They caution you to make sure that your cast iron skillet is well seasoned to avoid reacting with the acidic tomatoes. I like to add about a tablespoon of butter in with the oil to get some additional tastiness. You can pull together this dessert fast and have it cook while you’re eating. It’s totally simple and you’ll wonder why you weren’t making it before. A Southwestern flare on cornbread, and I like it. BonAppetit.com staff writer Rochelle Bilow says it’s “the greatest recipe of all time.” I can’t argue with that! I would make one little addition of cheddar cheese in the cornbread batter. I didn’t used to be a fan of chicken thighs or chicken skin. This dish made me change my mind. The chicken skin is like crispy bacon after the hot cast iron skillet. You finish the thighs in the oven for a perfect roast. 1) Why yes, I do have a Lodge cast iron skillet sitting on my stove at this very moment! 2) AB is my all-time favorite cook, too; it is hardly an exaggeration to say that I learned everything I know about kitchen work from Good Eats. 3) I just sat down to meal plan my next seven days, and as I work exclusively in cast iron, I’m so excited to find this list! Thanks for the great ideas, Prof – very excited about this blog. I also love cast iron cooking and one of our favorites is diced smoked saucage and sliced yellow onions and French cit green beans and thin sliced potatoes all fried together in a little olive oil of course I fry the patatoes first then add eac ingredient and fry for about 10 minutes. I have many different cast iron pieces, some handed down from my great grandmother. Love cooking with cast iron. Just visited the Lodge cast iron store Saturday! Got my first cast iron skillet for christmas. So excited to try new recipess. Thanks for posting this! I love cooking in cast iron. I love cast iron cooking I have 5 different cast iron pieces that I inherited from my grandmother. 100% secure. I hate spam!